Foodies make the best friends because they know the best places to eat and are adventurous when it comes to trying new things. When shopping for a friend who loves to eat, a gift card to their favorite restaurant, just doesn’t cut it. Instead give them a little something that will excite their taste buds and reward the for being the adventurous foodie they are. You don’t always have to think outside the “box” on what to get them. So with that in mind, I’ve collected 5 food subscription boxes that any foodie would love. Here are 5 food gifts that are perfect for people who love to eat. Note: This blog contains affiliate links. They help pay for the coffee that keeps us turning out adventures week after week. I’ll only recommend and share products that I use and love myself. Thanks! Looking for a gift for any food lover, Taste Trunk has it. Unlike some subscription services, Taste Trunk allows you many options to choose from. Create your own trunk or choose your a preassembled trunk by theme or subscription style. Themes include Gourmet, Healthy, Gifts for Him/Her, and Sweet. Visit Taste Trunk to get started. Go organic with this weekly meal subscription box delivered to your door. This food box contains Sun Basket focuses on seasonal, responsibly sourced ingredients that are certified organic and non-GMO. The meats they use are grass-fed, antibiotic-free, and pasture raised. Choose 3 meals per week for 2 or 4 people. Gluten-Free, Paleo, and Vegetarian options are available. Imagine sampling artisan foods from around the country all in one place. That’s what you get with Mantry’s food subscription box. Every 2 months, you receive a specially curated box with 6 full size products made in the USA, editorial stories, and recipes. It’s the #1 food Gift for Men, but I think you’ll agree that any foodie would love this. Visit Mantry.com to get started. Get the Ranch to Table experience with some of the best quality beef and pork in the country. This family owned business takes great pride in the farm and it shows. Celebrated by chefs and foodies across the US, now you can enjoy their products at home. 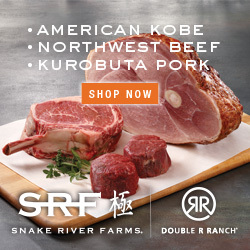 Try one of their American Kobe Steaks or Kurobuta Bacon. Visit BBQ Box to get started.